A camioneta, specifically the one starring in the film “La Camioneta: The Journey of One American School Bus,” takes on a new life, going from American school bus to Gautemalan public transportation. Saturday, March 28 at 3 p.m. — WOODSTOCK — Billings Farm & Museum, gateway to Vermont’s rural heritage, will host the award-winning film “La Camioneta: The Journey of One American School Bus” on Saturday, March 28 at 3 p.m.as part of the 5th Annual Woodstock Vermont Film Series. 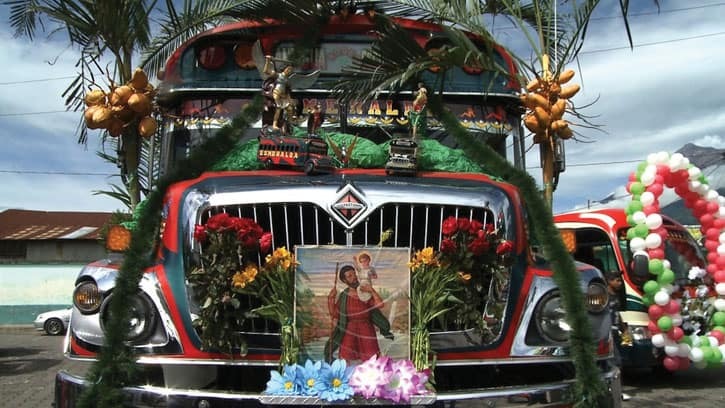 The journey of one of the many decommissioned American school buses that, lovingly repainted and elaborately decorated, are reborn in Guatemala as camionetas, and used for local bus service. This particular transformation involves a dangerous road trip from Pennsylvania across Mexico where, as one driver says “anything can happen,” to Quetzaltenango, Guatemala’s, second largest city. The film is subtitled and not rated. It garnered awards: International Documentary Assn., Documentary Award; two additional wins. Tickets prices are $5-6 for children; $9-11 for adults. For a complete list of screenings and info, visit www.billingsfarm.org/filmfest or call 802-457-2355. Billings Farm & Museum is located one-half mile north of the Woodstock village green on Vermont Route 12.